ESCA Management School is located in the heart of the business district of Casablanca City. This cosmopolitan city energetically propels Morocco forward with a communicative joy. By 1912, European architects built a model city, combining visionary modernity and traditional charm, and organized its rapid development. International deals and negotiations are conducted in Casablanca, where shops and malls abound, high-tech industries stand alongside international hotels, and worldwide conventions take place. Casablanca truly embodies modern Morocco. Studying at ESCA Management School is a fantastic opportunity to live in the heart of the economic powerhouse of the Kingdom, where you will discover a completely different Morocco: self-confident, open to Western and Eastern influences, while maintaining its deeply-rooted sense of tradition. 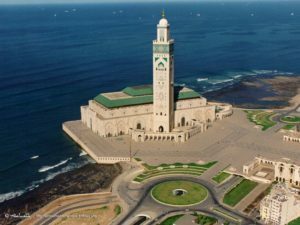 The Hassan II Mosque is the symbol of Casablanca. Completed in August 1993, this is the largest mosque in Morocco and Africa. Its minaret is the world’s tallest at 210 meters above the sea. The Mosque is a gem of Islamic architecture, now the third largest mosque in the world after Mecca and Medina. It is both a place of prayer and a subject of national pride. It successfully combines most modern technologies to traditional Moroccan craftsmanship techniques: titanium doors mounted on cylinders and opening vertically, cedar ceilings from the Middle Atlas and carved by Fez and Tetuan artists, sliding roof, underfloor heating, beautiful traditional stucco from Marrakech, etc. The edifice is a true masterpiece that is complimented by a vast esplanade, a library and an Academy of Traditional Arts, which testify, if we suspected, the eminently cultural dimension of Casablanca. Casablanca is the largest city in the Maghreb, , with nearly 4 million inhabitants. Since the 19th century, the city has grown steadily to the first business center, the first port, the first financial place and the largest university center of the country. Casablanca is the business city ‘par excellence’ and a crossroads for Morocco. Its international airport serves all major cities in the world, while the city’s commercial harbor, banks and financial services provides Casablanca with 65% of the country’s economic product. Casablanca’s first modern port was built in 1912. This date was a turning point in the history of the City, triggering and intensifying the economic development of the region, draining domestic and international investment. The port activity gave birth to the economic capital of the Kingdom, the dynamic and modern hub that we know today. Great Casablanca is one of the largest academic and educational centers in the Maghreb. Each year, more than 27 000 graduates from Casablanca Universities, Business Schools and Training Centers supply local and regional labor market. Higher and executive education in Morocco is substantially identical to the European model. It is composed of public and private institutions providing initial or vocational training. The instruction is provided in French and Arabic. Academic years consist of two semesters. Moroccan higher education is divided into two categories. On the one hand, higher education is mentored by the Ministry of National Education. It educates bachelor, master and doctorate students. On the other hand, the Ministry of Employment and Vocational Training provides professional education and train technicians. • More than 400 private centers for vocational training. You want to study in Morocco? As an international student, you have three months to get these tasks done. To apply for your residence permit, you must apply to the Foreigners’ Department of Casablanca’s National Security Services. Documents will be asked to complete your file. After filing your application, you will be given a receipt, which will replace the residence card until it is delivered. The residence permit is valid for one year. If you stay longer, you have to renew it every two months. Casablanca’s DNA as an international crossroads of mediation goes back to the Anfa International Conference hosted in the City in January 1943, when Winston Churchill, Franklin Roosevelt and Charles de Gaulle paved the way for a pact between the allies that would change the course of World War II. From this glorious heritage, Casablanca retains a taste for cultural blending, colors and rhythms. The city annually welcomes a growing number of international tourists who are attracted by both the heritage of the city and its shopping malls. Foreign communities are definitely established and particularly well integrated in Casablanca, which offers a friendly, lively living environment. Casablanca is the main gateway to Morocco, at the crossroads of the Atlantic and the Mediterranean.The unique position of the Kingdom enables Morocco to figure as a geostrategic crossroads of civilizations, and to position itself as a champion of multidimensional economic dialogue. This unique geographic position, coupled with a business environment offering the best international standards, makes Morocco a regional hub with significant competitive and comparative advantages. Morocco combines a triple African, Mediterranean and Arab identity. The country enjoys political, economic and social stability and demonstrated its resilience to meet the financial crisis and Arab revolutions through a set of proactive reforms. As the largest producer of phosphates, the country has embarked on an ambitious project to modernize its economy, which enabled Morocco to gain 50 positions in the “Doing Business” World Bank Ranking within 10 years. The area which is today Casablanca was founded and settled at the 7th century by Beghouatas Berber tribe. 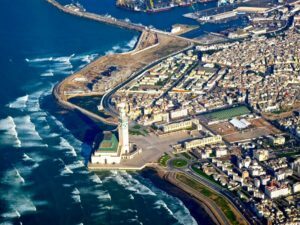 Ancient Casablanca is referred to as “Anfa” (“the hill”), a large, prosperous harbour that rose in importance until it came under Portuguese control in 1468. The town was reconstructed at the end of the 18th century by Sultan Mohammed ben Abdallah, who called the city “Dar-el-Beïda”, the Arabic translation of the Spanish “Casa Blanca”, meaning “white house”. He built ramparts and fortifications, mosques and hammams (Oriental baths). Casablanca initially remained a modestly sized port. In the 19th century, the area’s population began to grow as it became a major supplier for France and Great Britain, and shipping traffic increased. In 1907, French took control of Casablanca, which began the process of colonization of Morocco. During the 1940s and 1950s, under the French protectorate, European formed half the population of Casablanca. Commissioned by French Marechal Lyautey, architect Henri Prost designed a development plan to discipline Casablanca’s spreading and give it the appearance of a modern European-like city. Art Deco buildings are erected, as well as modern medinas, and main streets radiate south and east. 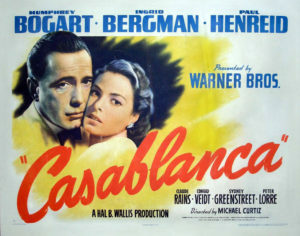 The city’s architectural heritage and diversity was made legendary by the movie “Casablanca” in 1942. Casablanca was a model of new town at that time, a laboratory of modernity for a new generation of architects who landed directly from the Parisian Ecole des Beaux-Arts. Made legendary by the film “Casablanca” (1942), the city has an important modern architectural heritage, due to the architectural diversity it knew during the twentieth century, where it was then the laboratory of modernity of a new generation architects who landed directly from the benches of the Ecole des Beaux-Arts in Paris. The Port of Casablanca has been considered the first port of Morocco since 1920, and the city became the first stop of Latécoère airlines connecting Toulouse to Dakar. As a strategic port, the city hosted the Casablanca Anfa Conference (Anglo-American Summit) in 1943. From the end of World War II, and following the speech of Sultan Mohammed V in Tangier, Casablanca became a major center of anti-French rioting, and a national base for independence claim. After independence, the city became the powerhouse of the country and the symbol of a modern, dynamic and open Morocco. Casablanca is today a real crossroads, and a national and international hub. Casablanca is the capital of the Great Casablanca region, and located about 80 km on the south of Rabat, the administrative capital of Morocco. The 2012 census statistics record a population of about 4 million. Casablanca is located on the plain of Chaouia, a historically agricultural region that still remains one of the main farming centers of the country. Its position on the Atlantic coast provides Casablanca with full access to sea resources (mainly for fishing). The forest area surrounding the city is named “Bouskoura”: it was planted in the 20th century and mainly consists of eucalyptus, pine and palm trees. The Casablanca tramway is 31 km long, with 49 stops. Further lines are planned in the future. Casablanca’s main airport is Mohammed V International Airport, Morocco’s busiest airport. Regular domestic flights serve Morocco’s largest cities. Casablanca is well served by international flights to Europe, especially French and Spanish airports, and has regular connections to North American, Middle Eastern and sub-Saharan African destinations. New York City, Paris, London and Dubai are important primary destinations. Casablanca is served by three principal railway stations run by the national rail service, the ONCF. Casa-Travellers is the main inter-city station, from which trains run south to Marrakech or El Jadida and north to Mohammedia and Rabat, and then on either to Tangier or Meknes, Fes, Taza and Oujda. 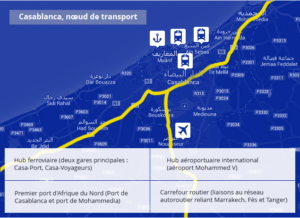 Casa-Port station is the nearest station to the old town of Casablanca. The station is currently being rebuilt in a modern and enlarged configuration. Registered taxis in Casablanca are coloured red and known as petit taxis (small taxis), or coloured white and known as grands taxis (big taxis). As is standard Moroccan practice, petits taxis provide metered cab service in the central metropolitan areas. Grands taxis provide shared service within the city or inter-city services. The dirham is the currency of Morocco. Its ISO code is MAD. It is subdivided into 100 centimes. There are 4 dirham banknotes (MAD 200, 100, 50 and 20) and 7 coins (MAD 10, 5, 2, 1, ½, 0.20, 0.10) dirhams, 2 dirhams, 1 dirham ½ dirham, 20 cents, 10 cents). Each banknote has a specific color. 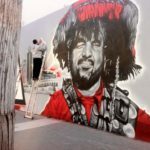 The last series feature a portrait of King Mohammed VI and the royal crown. The previous series featured King Hassan II, father of the current king and former king until his death in 1999. Morocco’s official languages are Arabic and Berber. The country’s distinctive Arabic dialect is referred to as Darija. • French is widely used in governmental institutions, media, mid-size and large companies, international commerce with French-speaking countries, and often in international diplomacy. • English is the first foreign language at school and Spanish is spoken by a small population in the north of the country, especially around the Spanish enclaves Melilla and Ceuta. Morocco’s predominant religion is Islam, accounting for 99% of the population. It is the official religion, but the coexistence with other religions is effective, and the practice of other revealed religions is guaranteed by the Constitution. The Jewish community consists of about 7 000 members, and the Catholic and Protestant community accounts for 25 000 members. The day is punctuated by five calls to prayer. Religious life follows the Muslim calendar. It began in 622, the year when the Prophet of Islam Muhammad left Mecca to Medina to establish where he had many more followers. The Hijri year, lunar year consists of 12 months, but is shorter than the solar year. Ramadan and the major religious holidays vary from the Gregorian calendar. Civilian life is governed by the Gregorian calendar. Unlike other Muslim countries, the weekend includes Saturday and Sunday. Friday is not a holiday but governments and utilities extend their lunch break to allow the faithful to go to prayer. Moroccan cuisine has long been considered as one of the most diversified cuisines in the world. This is a result of the centuries-long interaction of Morocco with the outside world. The cuisine of Morocco is mainly Berber-Moorish, European, Mediterranean cuisines. The cuisine of Morocco is essentially Berber cuisine, influenced by Sephardic cuisine. Spices are used extensively in Moroccan food. While spices have been imported to Morocco for thousands of years, many ingredients such as saffron, mint, olives, oranges and lemons are home-grown. Couscous is the most famous Moroccan dish along with pastilla, tajine, and harira. The most popular drink is “atai”, green tea with mint. Moroccan pastries are very popular: kaab el ghzal (“gazelle’s horns”) is a pastry stuffed with almond paste and topped with sugar. Medical care is highly developed in Casablanca: public and private hospitals, general practitioners and specialists, medical laboratories and pharmacies, radiologists, ophthalmologists and dentists. Doctors have often been educated in Europe or North America and the whole spectrum of specialties is covered and offers the most modern means. Emergency relief is of good standards and there are all current medications. As regards sports, the city of Casablanca is proud to host a major international marathon, and to offer clubs and multi-sport complex. The city also has a rich and diversified cultural life, with a large variety of cultural places (theaters, libraries, museums, cinemas, foundations, art galleries, etc. ): Abderrahman Slaoui Foundation, Art Manufactures (erected on the former slaughterhouses), I-Max 3D Morocco Mall cinema, Anfa cultural complex, the French Institute of Casablanca, Casa Del Arte, the Twin Center Auditorium, German Cultural Center, Spanish Cervantes Institute… The city also offers various cultural programs through the year: Jazzablanca Festival, Theatre & Culture Festival, Casa Music Festival, etc. While the city is known for its intense, cultural activity, Casablanca is also covered by green spaces: in the city center, the Arab League Public Garden is where Casablanca inhabitants go for a walk or a run in the morning. The aisles of the park are lined with palm trees, pergolas and arches that give it shade and coolness during the summer. In the middle of the park is the former Cathedral of the Sacred Heart whose architecture mixes Art Deco and Gothic art. It is no longer a place of worship today. Cafes along the park allow you to enjoy mint tea under palm trees, while the city is bustling. On the road to the airport, a dozen kilometers away from the city center, the forest of Bouskoura can also be a place to walk close to Casablanca, along eucalyptus, acacias and pine trees, if you want to leave the hectic atmosphere of the city. Casablanca beaches are another cool option for fresh air: along the Atlantic Ocean, the long sandy beaches are perfect places to walk, swim and practice sports.